Most of the time I consider being frugal a virtue. Emily and I strive to live within our grad student means, so that necessitates cutting some frills from our lives. However, we need to be careful not to take this too far. There was a time in college when my friends and I moved from frugal to cheap that caused a great deal of tension within the group. In retrospect the whole incident was silly, but it influenced the way I approach money and generosity. About ten of my friends and I decided to go to Applebee’s to celebrate our friend’s birthday. We had a great celebration, but the trouble started when the check came. Three people had to leave early because they had a class, so they had left the money that they thought they owed and went to class. After they left, we decided that we were all going to pay for the birthday boy’s meal. Everyone passed in his money and we counted it all up to make sure we had enough. As you might have expected, we were short by about $20 (a decent amount for us poor college students). We set out trying to parse who had paid what and where we were short. Apparently we were taking an especially long time, because the waiter came back asking for the check. After some more struggling, one of our friends questioned our competency and she took the check from us since “figuring out a check shouldn’t be that hard.” After some struggling of her own, she took out her TI-89 from her purse (yes, we are that nerdy), but she still couldn’t figure out where the missing money was. At this point, I’m ashamed to say, we mocked our friend for thinking she was better than us and still being unable to figure out the deficit. The waiter came by a second time and we still didn’t have it ready for him. We finally had to give up and a few of us pitched in the necessary money to cover the rest of the check. In retrospect, there was definitely some fallout from us making fun of each other (in a fairly nasty manner). While several factors compounded to cause us to not have enough money, there was an easy solution that wouldn’t have resulted in insults. Since so many people were there, if each of us were just automatically willing to put in a few more dollars this whole thing would have been averted. But since all of us were so concerned with “fairness,” meaning we only paid just the amount we owed, conflict arose. Actually, the only person willing to put in more money was the birthday boy, which we refused since we were being “nice” and paying for him. I reiterate that this event on the whole is very silly, but I have become a more generous person because of it. I now recognize how stupid it is that a few dollars can cause problems within friendships and acknowledge that my desire for “fairness” is just an excuse for me to be stingy. Now I strive to be the person who is always willing to provide the extra bit that is needed, whether that is money, time, or just food for an event. So what was it about that check that we just couldn’t figure out? ORANGE JUICE! The birthday boy had ordered about 4 orange juices and it wasn’t clear on the bill that the total price of the orange juice was 4 times the amount listed. 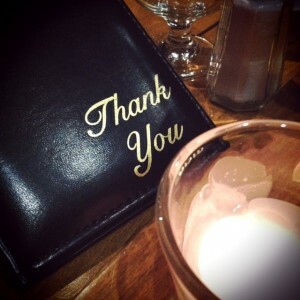 Well, that and the fact that the three people who left only gave enough money for their food and not for tax and tip. Do you have any experiences, however small, that have put how you treat your money and other people in perspective? 19 Responses to "Frugality in Moderation"
Relationships and money are tricky. In my humble experience, it is always better to take the side of the relationship. Of course, if that relationship starts being taken for granted, then that’s another problem. The new computer printout checks tend to be better, but restaurant checks aren’t easy to read all the time. Tax does seem to trip a lot of people up as well. Ha! People not putting in enough for tax and tip – or, even worse, ordering a meal that cost EXACTLY the amount of cash they brought – was incredibly annoying for me in college too. I got into the habit of always having my hand near my wallet for when when we came up short. It’s so helpful that now most restaurants are more willing to split checks or run multiple credit cards, even in the space of a few years, so this doesn’t really happen anymore. Your dividing line between frugal and cheap is a good one. I think once it starts negatively affecting other people, the line has been crossed. Yeah, now that most restaurants split checks or run multiple cards I don’t think this is an issue. I can’t remember the last time we had to split a whole check, and I don’t know if I could anymore because I never carry cash. Now everyone can be as frugal/cheap as they want without affecting anyone else (except for the waiter I guess). I remember moments like that when I was in college! I’m not sure we ever made fun of each other, but I definitely remember splitting bills and having everybody chip in. You’d always be short and left figuring out who didn’t pay their “fair” portion. It was the fact that our friend thought she could split the check “better” than we could. Or at least figure out why we weren’t done that started the teasing. Normally we were fine, but this occasion just got out of hand. Hi, Kyle! This post makes my skin crawl with remembering. My favorite story was going out with friends for sushi, and splitting rolls with one of my friends. When the bill came, he said, “I’m pretty sure you ate more of that roll than I did” meaning he wanted to pay less than half. Now, I would just rather treat someone than ever have that conversation ever again ever! I think this is something EVERYONE goes through….well unless you don’t have friends, then that’s a different story lol. But I know I went through this countless times. Everyone thinks they can do math right. Everyone has different ideas of how much tax is and of course, how much tip is. Someone always ends up paying more than they should, and it gets annoying dealing with people that are being too “cheap” that they can’t even make it easier for the rest of us. We now try to do separate bills, as much of a headache it causes the waiters… it just works out better. From Shopping to Saving recently posted..The Power of "Unlimited"
Relationships should always come first. I hate going out to eat with friends and having one person who wants to itemize everything. I would rather split it out evenly. So e times you ae going to come out ahead and sometimes you will pay a little more. You wouldn’t like going out with me! I actually can’t recall ever splitting a bill evenly – maybe there is a culture difference between our friend groups. Like others have said it’s usually easy to get separate checks now. I wouldn’t want to split evenly because I think I would come out behind most of the time, as I never order drinks and often will get an appetizer or salad in place of an entree. I have this situation almost daily when I go out for lunch with coworkers. Since we usually go in a somewhat of a group, the places don’t really like splitting up our bills and that takes forever. I’ve finally given in to the “cost of eating out with them” instead of the “cost of eating lunch”, even though it drives me nuts to pay for their drinks in part even though I didn’t order one, but it certainly isn’t worth the hassle at $1-2 or whatever it is. I took a new employee out for lunch recently and I wasn’t sure whether I should expense the lunch or not. My manager told me I should, but even if I couldn’t have, I still would have paid for the new employee as a treat. 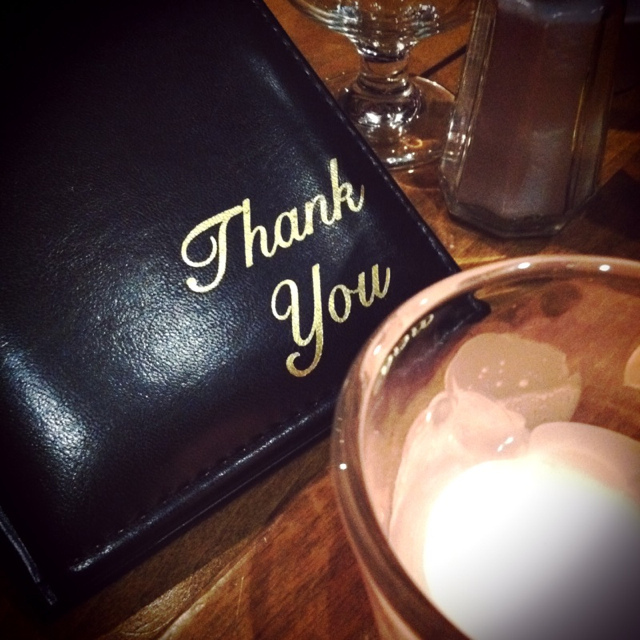 Leigh recently posted..Personal finance is…personal. I have always been a “split it quickly” kind of guy, while my roommate in college would obsess about every penny (“now, the tax on the phone bill should be 3/5 mine because I had 3/5 of the entire bill.” He knew he was “that way” (his words), so he’d always have to will himself to calm down when less analytical people were around. Like you said, it’s best to keep the friendship! That is one situation that I hate more than anything in the world, because it seems like 90% of the time, something like what you described happens. Typically, its short, but sometimes it’s way over the amount, including a nice tip, and no one knows what to do. When there’s far too much, we normally leave it on the table as everyone has paid what they wanted and I just consider it the waiter/waitress’ lucky day. When it’s short, the squabbling begins, and never ends, it seems. I’ve almost been in this situation before. About 10 of us went to a pizza place and we thought it would be cheaper to share whole pizzas rather than getting individual slices. When the bill came, we found out that the restaurant could split checks, but couldn’t split a pizza between people. It became complicated since different pizzas were different prices and different people ate a different number of slices. Finally one of the girls made the suggestion for the lone accounting major to split the bill (the group was mostly comprised of humanities and social science majors who were not confident in their math abilities). We all agreed. He decided that we should split the bill evenly and split the leftovers among those who had fewer slices for dinner. Luckily we all agreed so disaster was averted. After that, every time we went to that pizza place, we would partner up based on what kind of pizza we wanted and then split the bill in half. always so tricky!! I’ve noticed on several occasions when certain generous individuals politely (and discreetly) add way more than their share to the pot just so that this kind of confusion doesn’t happen. I think they just figure the waitress could use a couple extra bucks if it came to that, anyway.